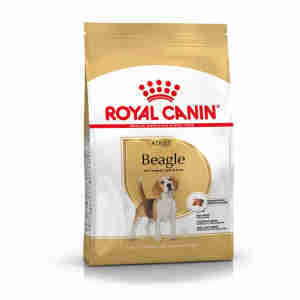 Royal Canin Beagal Adult is a complete feed for dogs, specially for adult and mature beagles over 12 months old. This formula helps maintain the Beagle’s ideal weight thanks to an adapted calorie content. FOOD INTAKE CONTROL - The kibble’s exclusive shape helps reduce the rate of food intake and encourage chewing. This formula also contains a combination of fibres. BONE AND JOINT HEALTH - This specific formula helps support healthy bones and joints and maintain ideal weight. Enriched with EPA & DHA. EXCLUSIVE KIBBLE - The kibble’s texture and formula are adapted to the Beagle dog. Ingredients: dehydratedpoultry protein, maize, rice, wheat, animal fats, maize gluten, hydrolysedanimal proteins, vegetable fibres, vegetable protein isolate*, beet pulp,minerals, fish oil, yeasts, soya oil, psyllium husks and seeds,fructo-oligo-saccharides, hydrolysed yeast (source of manno-oligo-saccharides),borage oil, green tea and grape extracts (source of polyphenols), hydrolysedcrustaceans (source of glucosamine), marigold extract (source of lutein), hydrolysedcartilage (source of chondroitin). ADDITIVES (per kg): Nutritional additives:Vitamin A: 28000 IU, Vitamin D3: 700 IU, E1 (Iron): 42 mg, E2 (Iodine): 4.2 mg,E4 (Copper): 5 mg, E5 (Manganese): 55 mg, E6 (Zinc): 164 mg, E8(Selenium): 0.09mg - Preservatives - Antioxidants. ANALYTICAL CONSTITUENTS: Protein: 27% - Fatcontent: 12% - Crude ash: 6.1% - Crude fibres: 3.7% - EPA and DHA fatty acids:3 g/kg. Biscuits are smaller than I thought but my beagle at least gives one bite which is an improvement to her inhaling food. I use a slow feeding bowl and with the shape of biscuit she has gone from 30 seconds to 4 minutes at feed times. Only been using food for a few weeks but She is is happy on this food and starting to see she does not appear as hungry.